As one of the largest technology companies in the world, IBM pulled in nearly $82.5 billion in revenue last year, according to the 2016 Fortune 500 List. 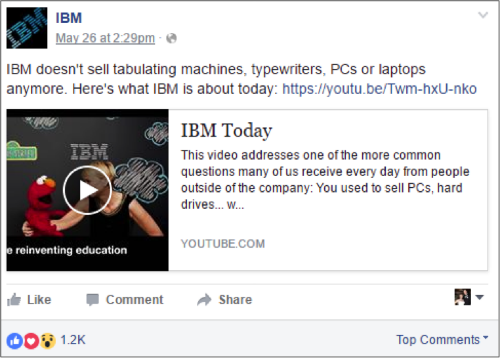 IBM’s Facebook page is filled with inspiring videos, articles and quotes that showcase the amazing innovative technology it’s bringing to the world and how’s transformed over the. A great example is this video that aims to show IBM as so much more than a company that produces computers. The video post got more than 1,200 likes and 571 shares. The company also offers behind-the-scenes access to give its followers to connect its followers with its technologies and products in action. Cisco does a fantastic job of connecting their products and technologies with current events and topics to drive awareness and engagement. 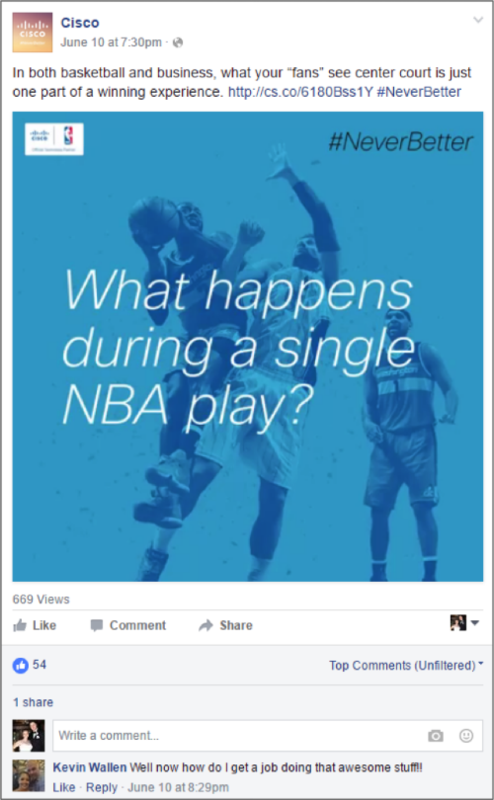 For example, this recent post features a short video that showcases Cisco’s partnership with the NBA aimed at improving the fan experience. Sprinklr is all about helping other businesses harness the power of social media and create valuable social experiences, so it’s no wonder that they’ve put some of what they preach into their own social efforts. 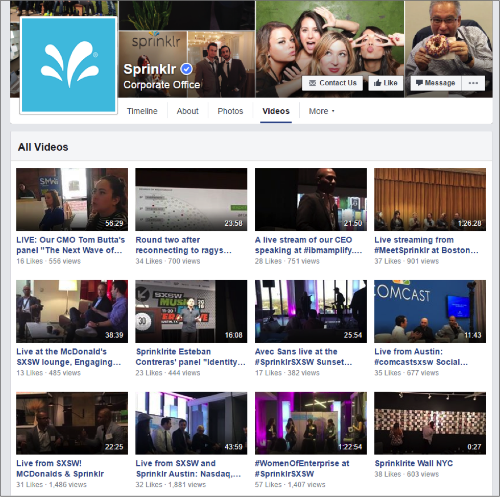 When it comes to Facebook, Sprinklr often shares links to topical and interesting blog posts they’ve whipped up, but videos that show company execs and employees in action drive great engagement. From eye-catching photos and videos to behind the scenes looks, Intel uses Facebook to bring its audience along for the ride and show them how their technology is being used in a variety of different ways—such as providing real-time data at the X-Games in Austin, TX. 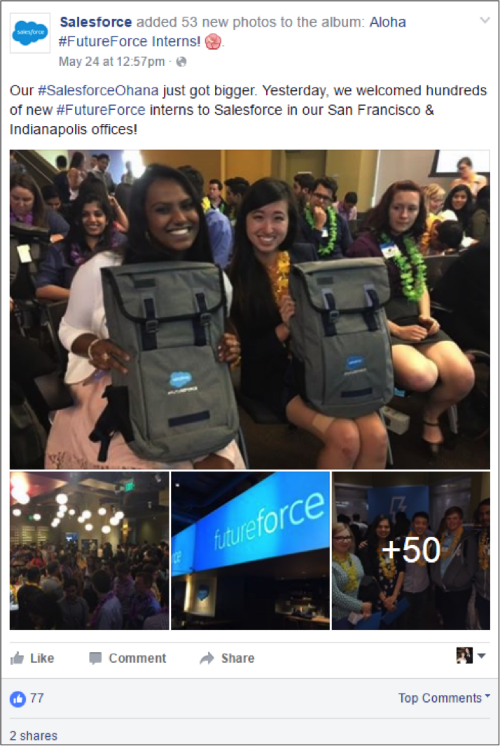 From the latest company news to topical articles to videos and images, Salesforce is a great example of offering a Facebook audience a variety of media and links to pique interest. On McKesson Corporation’s Facebook page, rarely will you see any post promoting a product or service. 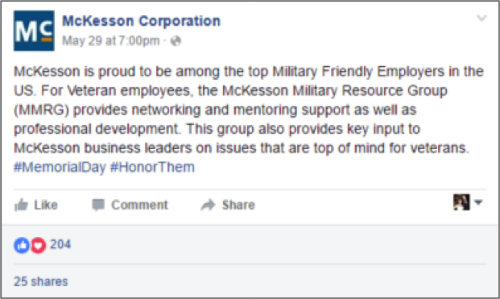 Instead, the healthcare services and technology company’s Facebook page is dedicated to highlighting the people and programs behind McKesson—making it an excellent recruiting tool and a way to show the values the company holds dear. Like McKesson Corporation on Facebook. 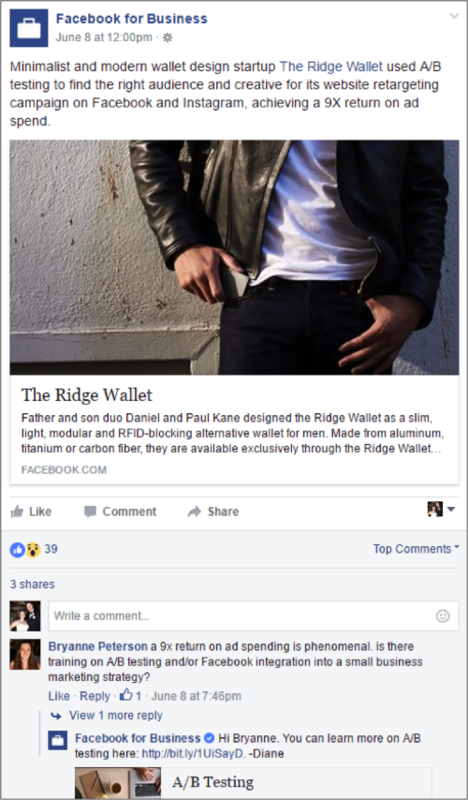 While Facebook for Business is the social media network’s marketing page—mostly aimed at showing the value of Facebook advertising—it’s definitely worth following to get a look at how other brands are using the ad options to take their efforts to another level, as well as for best practices and tips. What Do These Facebook Pages Have in Common? 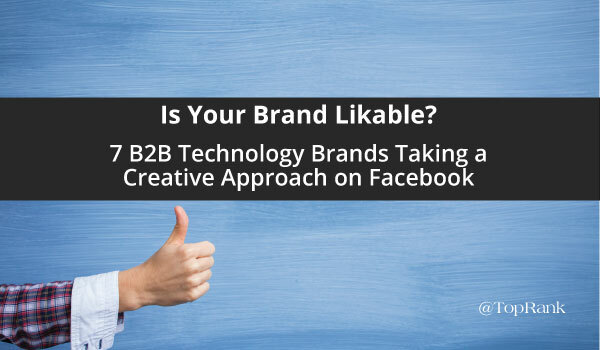 You may or may have not noticed that there is a common thread among all of the B2B technology companies utilizing Facebook marketing listed in this post. 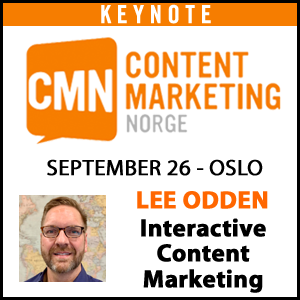 That commonality is that they all share engaging content about PEOPLE. Their strategy isn’t just about the products and services, it’s for the people that buy those products and services. 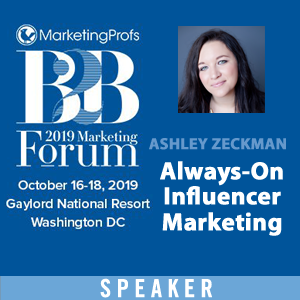 What other B2B businesses would your recommend following on Facebook? Please share in the comments section below! Caitlin, these are all excellent examples of how to better humanize your content. My only issue is that these are all examples of companies (with the exception of Sprinklr, which I know little about) that most likely have marketing budgets in the millions of dollars and teams of people brainstorming ideas and executing them. What advice would you give to a much smaller B2B company that has a single person producing content on a shoestring budget? I can appreciate these examples, but I’m having trouble translating that into reality for my efforts. Thank you! Hi John! Thanks for reading. You’ve certainly made a valid point. Small businesses often feel they don’t have the cash or the time to invest in just basic social upkeep, let alone highly creative campaigns. But I think that looking to some of these big dogs can definitely get the wheels turning. While these companies do have resources, I think that they’re showing off their personality, their company values and they’re attempting to engage their audience in something that is of interest to them — not just sell them their services — and that is something that small businesses can definitely do if they carve out a little time and a little budget. 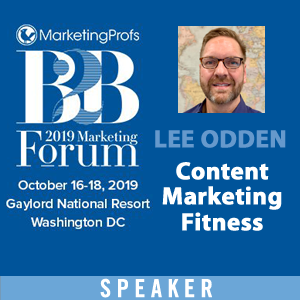 Perhaps the first thing you could do is take a look at your analytics and see which social platforms are seeing the most engagement and driving the most traffic to your website, and take note of what content is resonating with them. This will help you start to form a better picture of your audience so you can better engage them.